POPE FRANCIS: THE CROSS, THE DOOR OF THE RESURRECTION. Dear brethren in Christ, below you have the Zenit translation of the address Pope Francis gave today, March 12, 2017, before and after praying the midday Angelus with those gathered in St. Peter’s Square. Interesting read and text worthy to meditate. 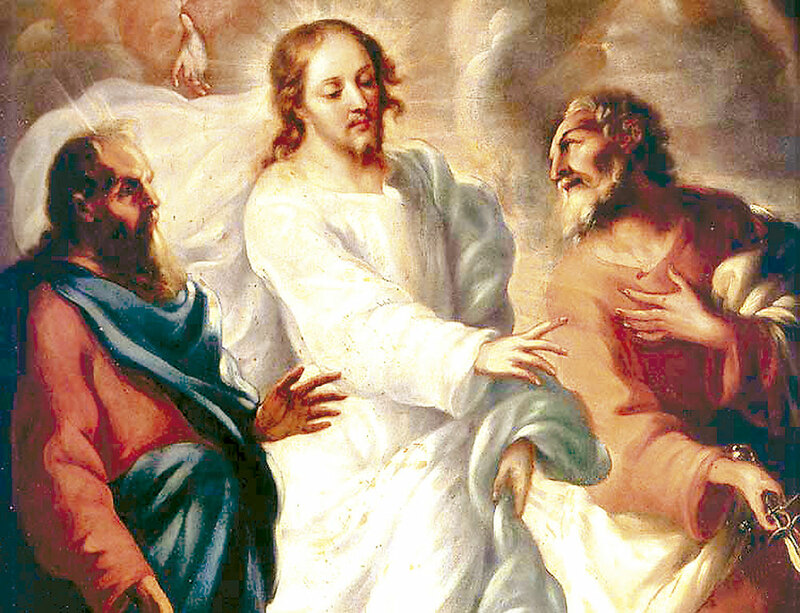 The Gospel of this Second Sunday of Lent presents to us the account of Jesus’ Transfiguration (cf. Matthew 17:1-9). Taking three of the Apostles, Peter, James and John aside, He led them up a high mountain, where this singular phenomenon happened: Jesus’ face “shone like the sun, and His garments became white as light” (v. 2). Thus the Lord made that divine glory shine in His person, which could be received with faith in His preaching and in His miraculous gestures. And, accompanying the Transfiguration on the mountain was the apparition of Moses and Elijah, “talking with Him” (v. 3). The “luminosity” that characterized this extraordinary event symbolized the purpose: to illumine the minds and hearts of the disciples, so that they could understand clearly who their Master was. It was a flash of light that opened suddenly on the mystery of Jesus and illumined His whole person and His whole story. Now firmly on the way to Jerusalem, where He would suffer the condemnation to death by crucifixion, Jesus wished to prepare His own for this scandal — the scandal of the Cross –, for this scandal too strong for their faith and, at the same time, announce ahead of time His Resurrection, manifesting himself as the Messiah, the Son of God. And Jesus prepares them there for that sad moment of so much grief. In fact, Jesus was showing himself a different Messiah in regard to the expectations, to what they imagined about the Messiah, how the Messiah was: not a powerful and glorious king, but a humble and vulnerable Servant; not a lord of great wealth, sign of blessing, but a poor man who had no place to lay His head; not a Patriarch with numerous descendants, but a celibate without a home and without a nest. It was truly a revelation of God turned upside down, and the most disconcerting sign of this scandalous reversal is the cross. But precisely through the cross Jesus will attain His glorious Resurrection, which will be definitive, not like this Transfiguration that lasted a moment, an instant. Jesus transfigured on Mount Tabor wished to show His disciples His glory not to avoid their passing through the cross, but to indicate where the cross leads to. One who dies with Christ, will rise with Christ. And the cross is the door of the Resurrection. One who fights with Him, will triumph with Him. This is the message of hope contained in Christ’s Cross, exhorting to fortitude in our existence. The Christian Cross is not a furnishing of the home or an ornament to wear, but the Christian cross is an appeal to the love with which Jesus sacrificed Himself to save humanity from evil and from sin. In this Lenten Season, we contemplate with devotion the image of the crucifix, Jesus on the cross: it is the symbol of the Christian faith; it is the emblem of Jesus, dead and risen for us. Let us so regard the Cross as marking the stages of our Lenten itinerary, to understand increasingly the gravity of sin and the value of the sacrifice with which the Redeemer saved us all. The Holy Virgin was able to contemplate Jesus’ glory hidden in His humanity. May she help us to be with Him in silent prayer, and to let ourselves by illumined by His presence, to bear in our heart, through the darkest nights, a reflection of His glory. I express my closeness to the people of Guatemala, who are mourning for the serious and sad fire that broke out in the Virgin of the Assumption House of Refuge, causing victims and wounds among the girls living there. May the Lord welcome their souls, heal the wounds, console their grieving families and the whole nation. I pray and ask you to pray with me for all girls and boys victims of violence, mistreatments, exploitation and wars. This is a plague, this is a hidden scream which must be heard by all of us and which we cannot continue to pretend that we do not see or hear it. A warm greeting goes to you all here present, faithful of Rome and of so many parts of the world. I greet the pilgrims of Fribourg and Mannheim, in Germany, as well as those of Lebanon and the marathoners of Portugal. I greet the parish groups from Gioiosa Ionica and Pachino; the youngsters of Lodi who are preparing for their “Profession of Faith”; the students of Dalmine and Busto Arsizio: what you say is true: “No to the disposable culture” [he reads the banner]; and the “Drop after Drop” youth choir of Bergamo. GOD CALLS US TO CONVERSION. LET US RETURN TO HIM.